Many people are put off by makeup because they’re under the impression they need a lot of products and that it takes an age to apply them. Then comes the issue of, what products should you actually buy? And how do you apply them? But in reality, you only really need a few basic products in your everyday makeup routine. These products are super simple to apply. And you’ll be able to apply them in less than 5 minutes. Plus they’ll instantly make you look and feel utterly fabulous. 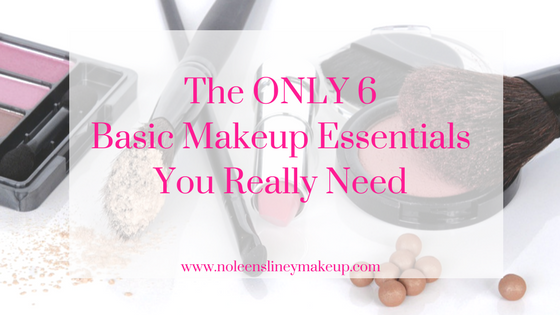 So are you ready to find out what the ONLY 6 Basic Makeup Essentials you really need are? Before I reveal the products, I’m first going to dispell 3 myths for you. 1. You DON’T need a lot of products to create a beautiful, natural look. 2. It does NOT take a long time to apply makeup every day. 3. The ONLY thing that makeup significantly changes is your self-confidence. So what DOES makeup do? Makeup should make you look like YOU, only even more beautiful. It enhances your naturally beautiful features, not change them or cover them up. Think about a gorgeous piece of clothing you own that you LOVE to wear. You wear it because it enhances a particular part of your body. And it makes you look and feel amazing. Perhaps it enhances your gorgeous figure or your lovely legs. Or maybe it really brings out the colour of your eyes. Either way, it makes you look and feel FABULOUS. And yet you still look like you. Makeup does the exact same thing. So now that you know makeup still makes you look like you, that you can apply it in minutes and that you really only need a few products, let’s get started with what those basic makeup essentials actually are. Now, I’ll be the first one to admit that there are SO many makeup and beauty products we’re told that we absolutely need! Yet half the time they’re totally unnecessary. But face primer is NOT one of those products! And it makes my list of the only 6 basic makeup products you actually need for very good reason. For one thing, it’s actually an extension of your skincare. And it’s the basis for a smooth, even makeup application. Whilst you may think applying a face primer is just another unnecessary step in your makeup routine. It’s actually going to save you time and money in the long run. But perhaps you’re still a bit unsure as to what it is. 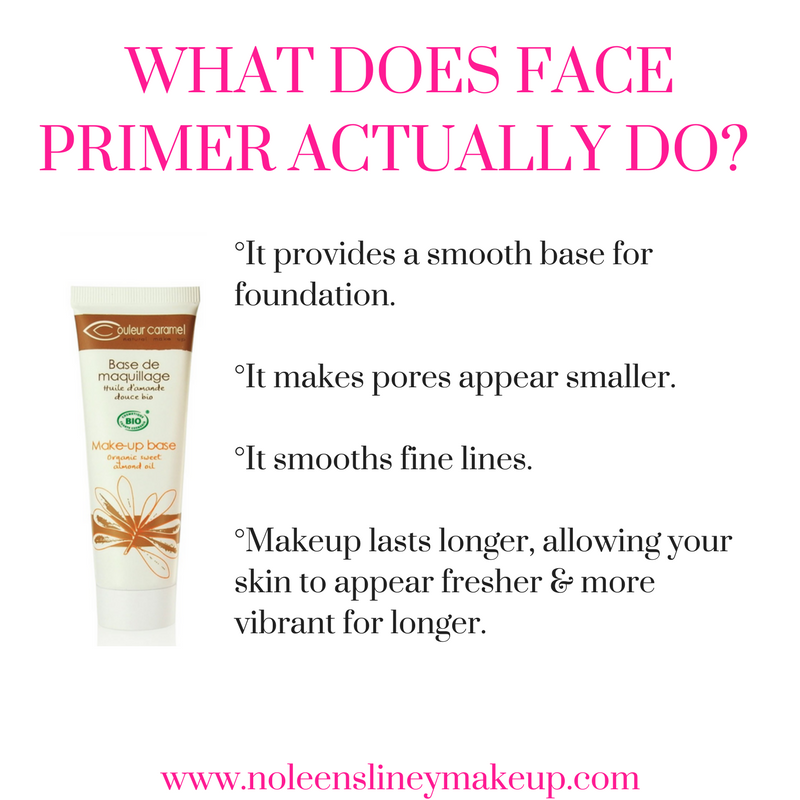 So if this is you, make sure to read my post explaining what face primer is, what it does and why it’s a must-have in your beauty routine. Apart from mascara, concealer is one of my can’t-live-without makeup products. I actually consider both of then my top two basic makeup essentials. Concealer is a little miracle worker to me. And it instantly does a great job of making me look and feel better. A lot of people get confused between concealer and foundation and what each one actually does. So I’ll break this down for you now. It’s actually concealer that’s really going to do all the hard work for you, not your foundation. Concealer is essentially a colour corrector. Its purpose is to counteract or neutralise discolouration such as redness or pigmentation marks. It lightens shadowed areas such as dark circles under the eye area or around the mouth. And it can also camouflage blemishes. Concealer is generally thicker in consistency than foundation, as just like face primer, it’s laying the groundwork for your foundation. Now I’m not going to go into too much detail today about how to choose the correct shade of concealer, as this topic takes a little bit more explanation. So I’ve written a second post explaining the correct way to choose your perfect concealer shade. Make sure to check it out, as this is a vital step to know before wasting your money on buying the wrong concealer for your skin tone. So many of my clients tell me that they’re afraid to wear foundation because they don’t want to look like they’re wearing a mask! Let me reassure you that wearing foundation is not going to make you look like you’re wearing a mask! Foundations have come a very long way over the past decade. And when you choose the right foundation for your skin type, it’s going to look and feel amazing. It will make your skin look refreshed, radiant and like you had 10 hours sleep (when in reality you’ve only had 4!). 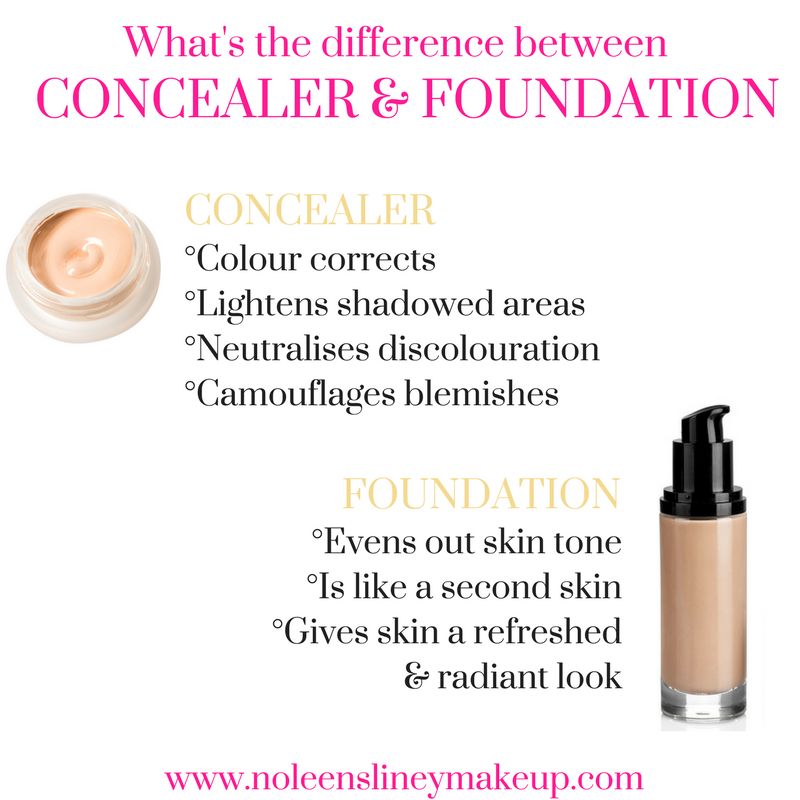 So what is the purpose of Foundation & how is it different to concealer? Whilst the purpose of concealer is to colour correct, the purpose of foundation is to even out your skin tone. Your foundation is almost like a second skin. It should look like you’re not wearing makeup at all and give the appearance of an even skin tone. Remember, LESS IS MORE when it comes to foundation. You don’t need to apply a lot of it. I actually prefer to apply concealer first, then foundation. That way, you won’t need to apply as much foundation, as you’re concealer will already have begun to even out your skin tone. Also, using less foundation gives a much more natural finish to the skin. It’s better to build up the product slowly. You can always apply a little more if you feel you need a bit more coverage. Like I said, a foundation should look like a second skin. It should not be noticeable that you’re wearing makeup. It should make you look like you, just much more awake and refreshed. Whilst choosing the right shade of foundation is important. It’s NOT the most important part of choosing a foundation. You need to first consider your skin type! Make sure to have a read of this article where I’ve explained in greater detail how to choose the right foundation for your complexion. Blusher is another one of those products that people often shy away from. One of the main reasons being that they don’t know how to apply it. But blusher is such an amazing little product. It can make you go from looking tired and pale to fresh and radiant in seconds. For this reason, blusher makes it onto my basic makeup essentials product list. Perhaps you’re someone who’s put off by blusher. Maybe you’re scared that the shade of blusher is going look too dark on you. Or even worse, that it’s going to make you look like a clown! Don’t worry. It absolutely does not have to be like that. The key to applying blusher correctly is the amount you apply and where you apply it. Once you learn how to do those two things, you’ll wonder why you hadn’t been applying blush all your life! I’ve explained here how to choose the best blusher for your face. So if you need help deciding whether powder or cream blusher is best for you, or which shade to choose, make sure to read this guide. If applying blusher is what you struggle with, this post teaches you how to apply blusher correctly. Trust me, it’s much easier than you think. No basic makeup essentials list would be complete without mascara. Mascara is my absolute favourite makeup product of all time! Simply applying just 1 coat of mascara makes you look INSTANTLY awake and refreshed. Even without applying any other eye makeup products, such as eyeshadow, it will enhance your eyes and will instantly give a more fresh-faced appearance. There are many different types of mascara to choose from, which can seem overwhelming. Especially if you’re a makeup beginner. The type of mascara you choose really just depends on the type of look you want to achieve. Be sure to check out my guide to choosing the perfect mascara for your eyes. In it, I’ve explained what the 4 main categories are and how to choose the best one for you. And last but not least on the list of basic makeup essentials are lip products. Applying a lip product really finishes off the look perfectly. Choose your favourite lipstick or lipgloss in whatever shade you feel like wearing that day. As the look is quite natural, you could even play around a bit and opt for more of a bolder or brighter shade. If lipstick or lipgloss isn’t your thing, why not try a tinted lip balm instead. These do the same job as a lip balm, but they have just a hint of a colour to them. They still look really natural. But the hint of colour will really add an extra touch of radiance to your face. And if you really don’t want to wear any of these, a regular lip balm will do just fine. I’ve never used makeup before. So which of these basic makeup essentials should I start with? If you’re completely new to makeup, I suggest starting off slowly by introducing 1 to 2 of the basic makeup essentials at a time. So for example, you could start off with concealer and foundation. Then you could introduce mascara and primer into your routine. And lastly blusher and lip products. Use this method if it feels less overwhelming to you. What if I only have a few minutes? If you really truly don’t have much time at all, just applying even a little bit of concealer and mascara will instantly make you look fresher and more awake. Not only will applying just these few products make you look better. They’ll also make you FEEL better. Which in turn is going to really allow your natural beauty to shine even more. As you can see, these 6 basic makeup essentials are so easy to apply. And it literally only takes a few minutes to apply them. There are, of course, other products which are great add on’s to these. But these 6 basic makeup essentials are great to get you started. Or for those days when you really don’t have any time at all. Remember, it’s better to have only a few products that you actually use and know how to use than a lot of products that you’ve no idea how to use or if they even suit you. Hi Zandra. Thanks for your comment. I hope this was really helpful for you. As you can see, it doesn’t have to be as complicated as many people make it out to be. Even just a few products can make a big difference and you can create a beautiful look with them. Hi Katharina, You’re very welcome and I’m so happy to hear this was helpful for you. Please let me know if you have any questions at all and I’d be more than happy to answer them for you.